Earlier this year The Metropolitan Museum of Art held a two-day symposium celebrating the exhibition American Woman: Fashioning a National Identity and the historic collection-sharing program between the Met and the Brooklyn Museum. One of the Speakers was Timothy Long, the curator of the costume collection at The Chicago History Museum. Mr. Long presented his collection with enthusiasm and excitement that made me want to jump on a plane to Chicago right away. The museum holds a huge collection of costume and textiles of over 50,000 objects. Some of them are landmarks in the history of fashion, like the Sorbet dress, and other less famous but equally fascinating. It is unique for a museum not primarily of costume to hold such an extensive collection, I set to interview Mr. Long in the hope of understanding how the collection came to be, the challenges of managing so may objects and to hear of his personal experience. 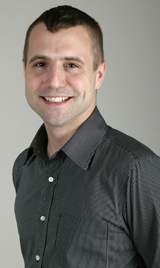 I am very excited to have Mr. Long as our first interviewee on the blog. K.BH. : How did you become a curator? T.L. : I started working at the Chicago History Museum as an intern and a year later I was asked to apply for the costume collection manager position, which I received. I worked in that position until 2005 when I became assistant curator of costumes and then, in 2006, assistant was dropped from my title. K.BH: Did you study curating or fashion history? Do you think academic training is important for a costume curator? T.L. : I took some fashion history courses in my undergraduate studies only. Fortunately, I was able to secure my current position without a master’s degree, but I think the degree is essential for longevity in the field and I am planning on taking a sabbatical in the next few years to complete my degree. K.BH: How many people work in the costume collection? and what do they do? T.L. : 2 full time staff members and one temporary mount maker. There is me and then the costume collection manager who manages the physical collection. The mount maker (or dresser) is the one who takes the clothing I choose for exhibition and places them onto mannequins. For one mannequin, this can take two weeks. T.L. : Connecting all research and exhibitions to Chicago history. K.BH: Why do you think the Chicago History Museum has a vast collection of 50,000 pieces? T.L. 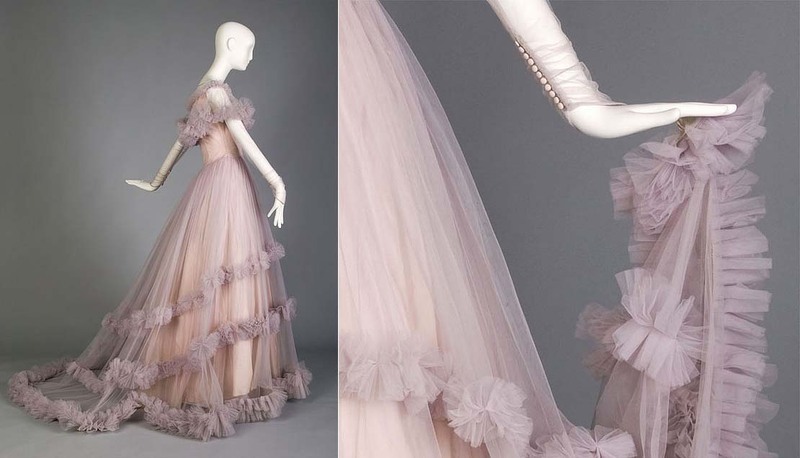 : We started collecting historic dress about 50 years before most North American collections. Plus, we had an early costume curator, Phyllis Healy, who took it upon herself to build the collection starting in the 1930s. After her death in the 1970s, we continued collecting dress and have always considered it a valuable study of history. Many people still do not value the importance of a costume collection, but thankfully, CHM has considered costume a valuable part of their collection since we opened in 1857. K.BH: What are the challenges of managing a collection as big as yours, as far as storage, cataloging and conservation? T.L. : It’s a lot of work. Plus, we need a lot of money to keep the collection going. As costume is just one of numerous collections in the CHM collection, we must share so many of our resources and the money simply runs out too soon. K.BH: What is the ratio donations/acquisitions? T.L. : In the ten years I have been at CHM, we have only purchased one collection of clothing items. Everything else is a donation. I would say that we collection an average of 5 clothing items per year. K.BH: Please tell us what is the process of acquiring new pieces, and what are the considerations that go into an acquisition/ donation offers? T.L. : Basically, the item must be connected to Chicago or the greater Chicago-land area. Donation offers are reviewed first by the curatorial staff that makes recommendations to the Museum’s Collection Committee. The committee is made up of staff knowledgeable in both the scope of the Museum’s collection as well as the conservation issues associated with artifact and document care. The committee uses the criteria specified in the Museum collecting scope, as well as its current collecting goals, to guide its decisions. It also takes into consideration the condition of the object and the availability of Museum resources required to store and care properly for the artifact or document as well as cataloging the material to make it accessible. The sensitive nature of materials or ownership of copyrights may also factor into acquisitions decisions. K.BH: What can you tell us about the birth of a new exhibition? How is the topic determined? how much research and planning goes into each exhibition? T.L. : The ideas for new exhibitions comes primarily from my experience with the collection. I typically let the collection tell me what type of exhibitions it can produce. I prefer starting with the collection so that I know the ideas can be supported by the collection. This is in sharp contrast to coming up with an idea and then taking months, if not years, to try and find the objects to help tell that story. With this route, you are often forced to borrow items from other collections, which I would prefer never to do. K.BH: How important are the women or men who owned the pieces? T.L. : Extremely. Without ownership, most items would simply not be related to Chicago. T.L. : I Do! Chicago Ties the Knot, which took 1.5 years to plan. The biggest challenge was narrowing down the thousands of wedding items we have in the collection to the ones that would fit into the exhibition (52 mannequins and 75 accessories). 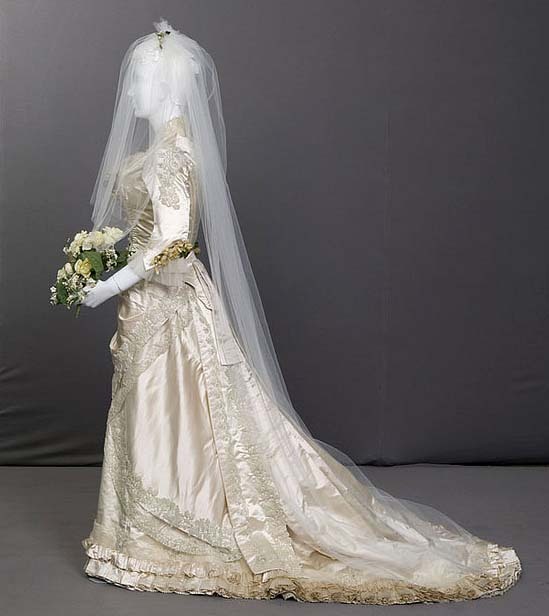 Wedding gown worn by Jane Easter when she married John William Straub, 1955. Sold at Marshall Field & Co. T.L. : I have always been very impressed with our collection of 19th century hair jewelry. I finally was able to include some of these items in my current exhibition, I Do! Chicago Ties the Knot. K.BH: What was your favorite costume exhibition in the Chicago History Museum and why? T.L. : During my time, I have most liked Chic Chicago. It was a wonderful experience to curate an exhibition with Dr. Valerie Steele and to have an exhibition of mine open on 7th Avenue. 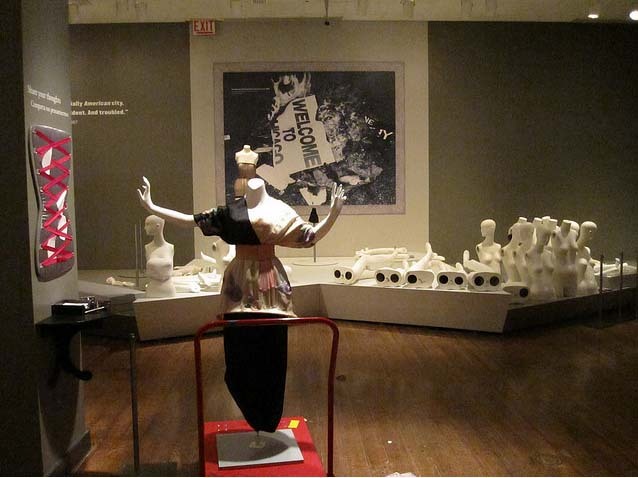 I also enjoyed sharing that exhibition with Chicago during its run at the Chicago History Museum. It was great to see so many people express pride in the fact that this exhibition was from Chicago. K.BH: What advice can you give to someone who wants to become a curator of costume and fashion? T.L. : Get a masters degree and take on as many internships as possible. All pictures courtesy of the Chicago History Museum. 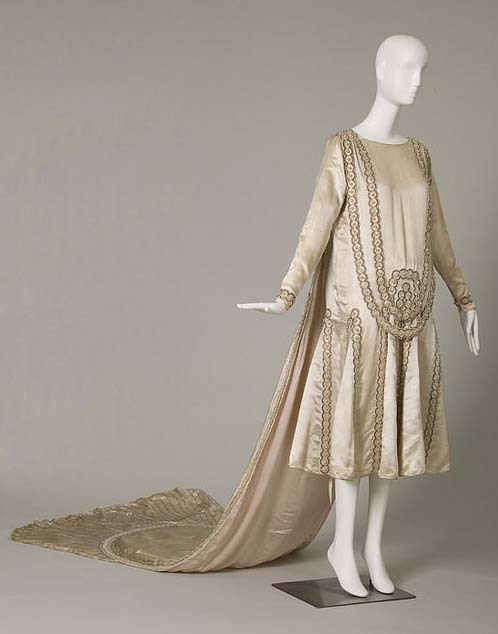 This entry was posted in interviews and tagged Chicago History Museum, curator, Lanvin, Marshall Field & Co, Poiret, Tim Long. Bookmark the permalink.